Is is a good idea to allow older children in the delivery room? Knowing whether to have your children in the delivery room is a very personal choice that is dependent on the child and the family dynamics. 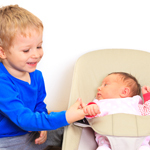 The older sibling’s personality will also play an important role in this decision. In the Sears family, many of the younger siblings were born at home, under the care of a midwife. The other siblings were present and it seemed to be a positive experience. My sister, Hayden, was 3 or 4 when she was able to watch her sister, Erin, be born. It was a special family time, and a completely positive experience. I would recommend that you should have someone that can take the kids to another room and be with them if things get crazy in the delivery room.